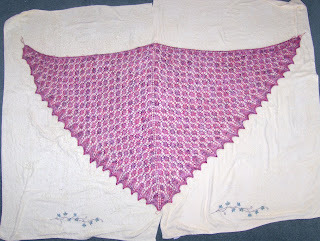 Here's my finished adapted version of Swallowtail Shawl by Evelyn A. Clark as featured in Interweave Knits. Mine is adapted in that it doesn't feature the Lily of the Valley section, because lovely as it is, it was too awkward in my chosen yarn. As well as that, this one has a good few more repeats than the original.I learned my lesson with the Shetland Triangle last year. I really enjoyed knitting this. 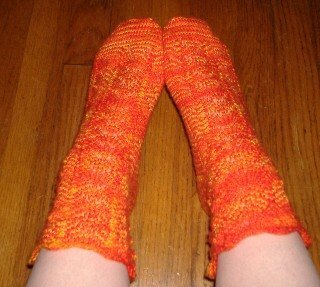 I used Rowan Damask in shade #46, Lava. I kind of stumbled into using this, I would never have considered using this for a shawl but I enjoyed making the headscarf so much, and got plenty of positive feedback, so I decided to go for it. I ended up using 5 balls of it and it will be a lovely summer wrap, or for posh occasions. You listening DH? I was happy that when I unpinned it the peaks just edged back slightly, they didn't jump back, they obviously weren't too overstretched when blocking, they WANT to be pointy peaks. Hope to take some outdoor action shots over the next couple of days. YOu've done a great job on that, Kathleen. It's gorgeous! Well done you!!! I hope you have lots of great occaisions to wear it, it's lovely! Very pretty Kathleen - gorgeous colour ! It looks lovely. Don't save it for posh times- wear it often. That is so pretty Kathleen - and in the damask very unusual. I agree, it will make a lovely shawl for a special night out!